Points : 7 out of 10. Illumion is the brainchild of Dutch musician Eveline van Kampen and, according to the press sheet, is the reification of an idea born in 2002 after she graduated from the conservatory and "desired a band to give the music in her head a concrete voice". The press sheet also states "musically it can be described as The Gathering vs Magenta and dashes of Ayreon...kind of." Unfamiliar with Magenta, on this I cannot comment, although I can hear very little of The Gathering. Arjen Lucassen's Ayreon, yes, although most certainly not The Gathering (in any of their generic incarnations). So what in actual fact do we have here? Instrumentation-wise, apart from guitars (distorted electric; steel and nylon stringed acoustic), bass, keyboards and drums, some tracks are also coloured with erhu (2-stringed Chinese violin), pipa (4-stringed Chinese lute), viola, and flute in quasi-conventional song structures. Quasi-conventional, that is, because any deviations from regular time signatures are subtly deployed and never make the listening experience awkward, or dominate the actual music. And the music, a largely chilled, mid-tempo affair, is very good. Okay, that's the plus side. What lets the album down is the lack of range on display in Esther Ladiges' vocals. The smooth tones and note-perfect delivery of her voice are amenable enough to the ear and, although heartfelt in one sense, her singing generally lacks any real passion, apart from occasional bursts of zest (such as the closing bar of 'Died for Beauty' or at moments during 'Whirlwind'). It is a somewhat pedestrian vocal performance for the most part (an exception is perhaps 'Into the Labyrinth' where Ladiges' singing works very well). 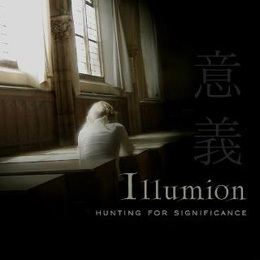 In short, Illumion's debut album is certainly a solid effort music-wise, although the aforementioned vocal homogeny is such a shame as the overall results could have been so much better. Incredibly nice cover artwork though, it must be said.